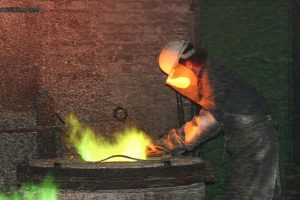 As raw materials, Dillenberg GmbH & Co. KG casts and processes foundry block bars and non-ferrous pristine metals (Cu, Sn, Zn, Ni, Al, Pb). Our main raw material is copper (Cu) and its various alloys (bronze, red-brass, special brass and composition bronze). 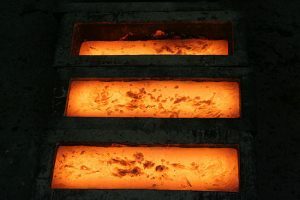 We primarily use metal from so-called secondary foundries that smelt recycled material and make it available to us in the form of block bars. Furthermore, we reuse the sprue and swarfs from our internal closed loop recycling material flow. In recent years we have made significant investments in expanding the capacity of our casting facilities. Today, we use state-of-the-art induction furnaces which exhibit a very high efficiency factor with regard to energy consumption and environmental protection. Additionally, these electric furnaces are operated with a peak monitoring system that helps to reduce peak electricity consumption. 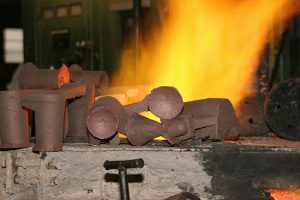 In the area of sand casting, we employ gas furnaces for a number of special melts and alloys. All our furnaces are equipped with modern exhaust systems that conform to the rigid emission laws of the European Union. Even after their practical application, our products are environmentally sound, valuable resources. They can be recycled without any further processing. If disposed of, our products and raw materials will not pollute the soil or the ground water. For us, environment and operational safety are two sides of the same coin. Each is a crucial quality feature and is therefore considered our highest priority.